Wonder Photo Shop Helps You Finish Your Photos with Fun. Wondering what to do with that great photo you just took? 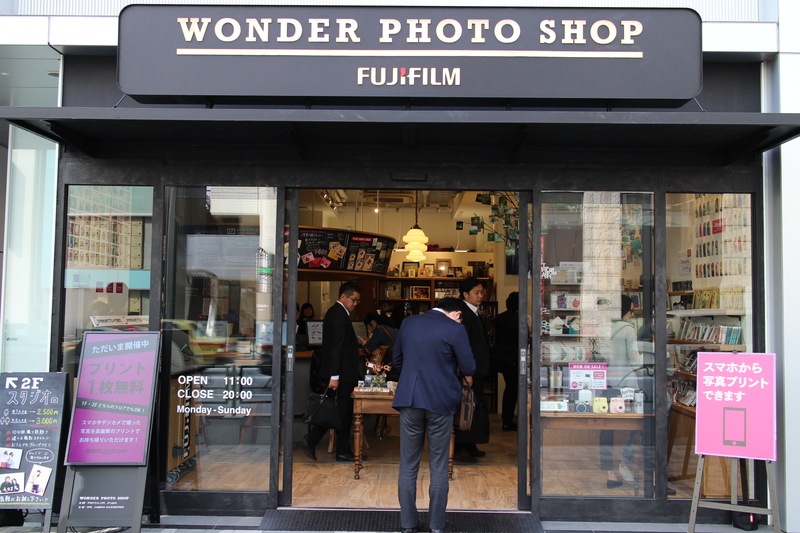 Check out Wonder Photo Shop in Harajuku. 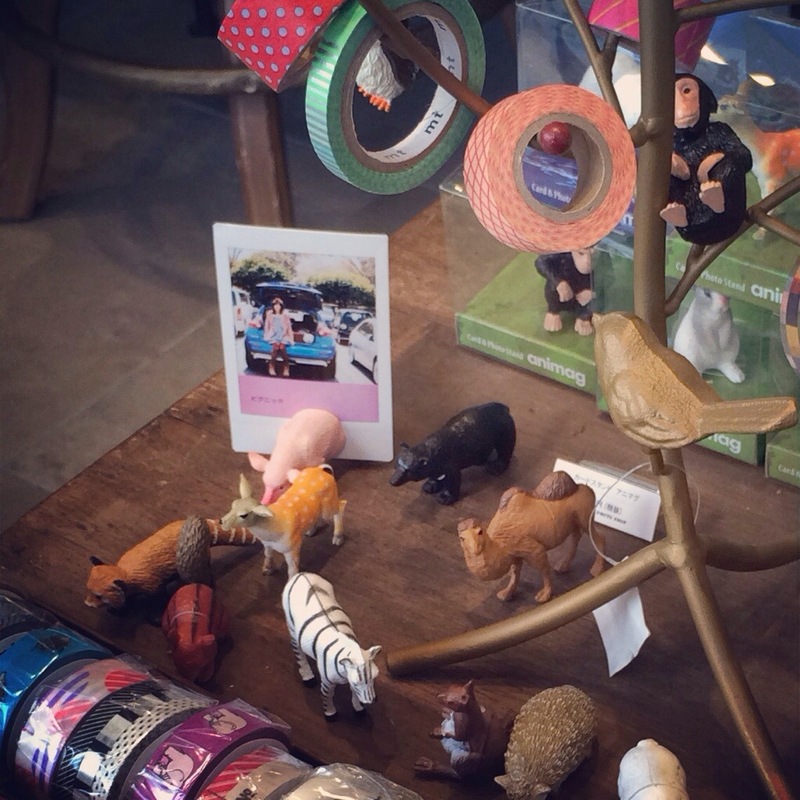 Wonder Shop is on Meji Dori 1 minute away from Omotesando Crossing. “I have my print, what next?” is an overlooked challenge in photography. The life cycle of a photo tends to be, print it, frame or album-book it and eventually shove it in a box when it got in the way or toss it. One huge advantage of digital photography is that our boxes full of photos are virtual instead of virtually all over the place. But photos aren’t meant to be forgotten in a shoe-box or on a hard-drive. Digital imaging allows us to be more creative with the format of our final images than ever. Wonder Photo Shop by Fuji Film can help you make your photographs into fabulous objects. I love this display idea. I wish I had the space (and the tree!) to do this at home. Whether you uphold the time-honored tradition of scrap-booking or just want to stick your photos in a cute album, Fuji Wondershop has an array of scrapbooks, albums and accents to help you along. 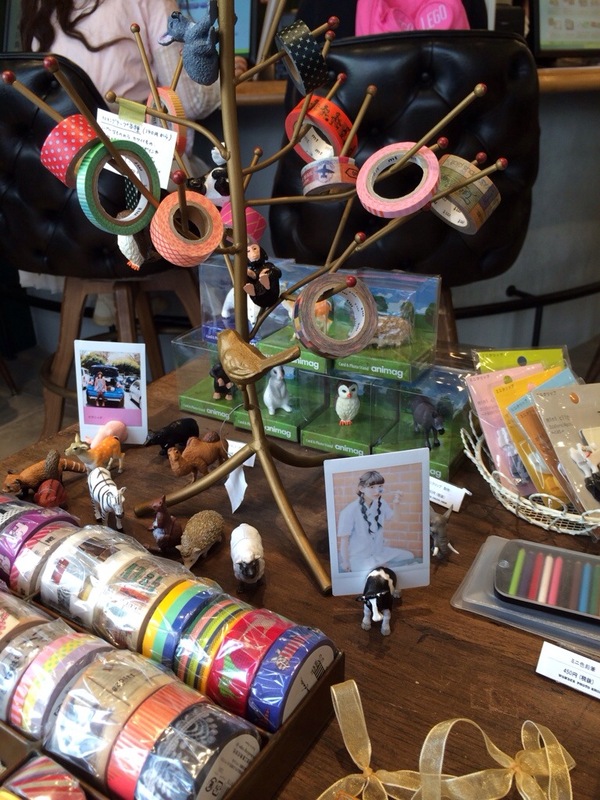 They have a nice selection of the Washi tape/ patterned masking tape which is quite popular recently. The tape makes a nice way to attach photographs to albums, books or papers. This tape is more forgiving than glue or stickers and, depending on the surface, generally can be pulled up a couple of times. Total inspiration for a future polymer clay project! 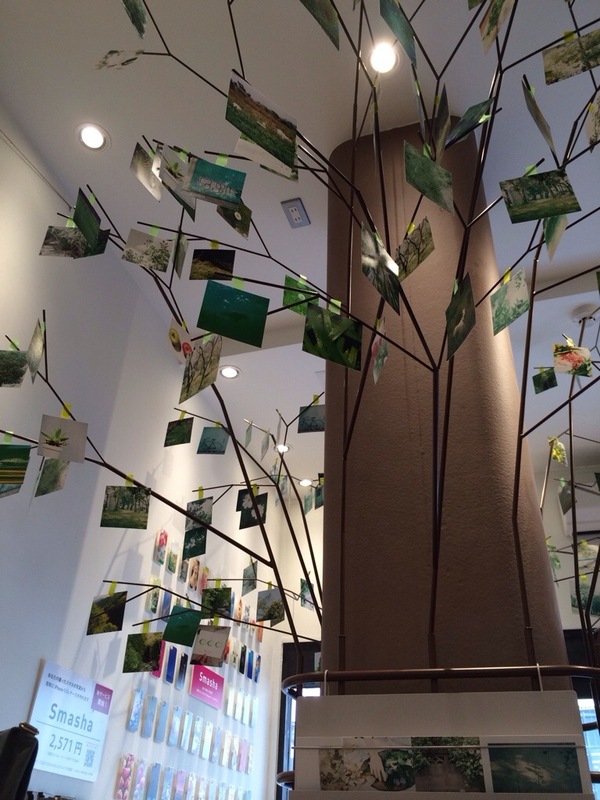 There are many frames or stands available for displaying photos. My favorite is the animal figure. It is cut in half with magnets attached to the middle. Place one half in front, the other behind and the magnets and animal keeps the photo upright. Like any modern photo store worth its salt, you can print directly from your smart phone via cable, or bluetooth with a photo printer. An L-sized print is 30 yen and is available fairly quickly. The shuffle print which looks like a more stylish contact print, might be a great way to show off Instagram prints. If you have more time, you can order large prints or print onto other surfaces. My favorite is making your own smart phone cover. I tried this and will be blogging about it next week. Examples line the walls and shelves to inspire your next project. Array of instamax film, 35 mm film and stationery items to make photos into treasured objects. If you are still loving analog and lomo-style, you can buy mini-instant film (polaroid style) for Fuji Instamax cameras. There is also 35mm film available and some cool 35 mm film cameras. For those with studio aspirations, there is a rental studio on the second floor. Wonder Photo is for anyone who wants to make easy, nice looking prints but the store definitely continues the women-friendly vibe found in magazines like Joshi Camera. (Joshi Camera has been promoting women-oriented photography and photo-finishing for some time) and Popeye Camera (locations in Jiyugaoka and Minato Mirai). I think Popeye was the first store in Tokyo to target the female photographer market with its selection of camera gear, paraphernalia, stationery and photo developing. Like Wonder Photo it’s a one-stop film/memory card-to-finishing photo store designed for everyone but very appealing to the female demographic. Universotokyo has a great review of Popeye Camera. Without stores like Wonder Photo and Popeye you would spend more time hunting down the same items at places like Bic Camera and Ito-ya Stationery then creating. The curation of photo-specific products and stores with specific samples of how they can be used is a welcome, and really fun, addition to living with photography and making it part of your lifestyle. Exit #7, 1 minute from Jingumae Station. You will be on Meiji Dori. Turn right (in the direction of Shibuya/ away from Omotesando). Use main exit (NOT Takeshita Dori exit) and walk down Omotesando towards Aoyama. Turn right at Meiji Dori (landmarks are Tokyo Plaza or Lotteria on the Burgers on the corner). Walk one minute. Shop on the right side of the street. Hours: 11:00-20:00 Every day except Year End/New Year Holidays. This entry was posted in digital content creation, Japan, Photography, reviews, Tokyo, Tokyo shops, Uncategorized and tagged analog, digital, film, Fujifilm, Fujifilm Wondershop, Harajuku, Lomo, photo printing, photography, shopping, Tokyo. Bookmark the permalink. 1 Response to Wonder Photo Shop Helps You Finish Your Photos with Fun.